In a spirit of collegiality and sharing, I admit that I experience the same with younger students who are enrolled in lessons by their parents. These kids have no choice in the matter. Some moms and dads have the idea that the Mozart Effect will filter from piano into school work without much effort. They’ve read articles in the news media about right and left brain development. These folks may be “My Baby Can Read” subscribers whose diapered tots were raising their tiny hands to letter prompts on a big screen, while Gerber’s mashed carrots dribbled down their mouths. My daughter used to grimace when I broke out the carrots and peas, but at the same time she was bathed in Handel’s Messiah excerpts that I blasted on a cassette player. Now she’s a world class writer/editor having done the WORK even as a child to develop her language skills. NO Baby Einstein tapes here, or Baby Can Read early exposures. Just READ, READ, and finish your homework in each grade up to college and beyond. By example, I had a very gifted 9-year old music student, who winged it from week to week. This was between lessons after we together focused on step-by-step ways to obtain lovely phrasing and expression. She was spoon-fed a meticulous practicing process in the hopes she would follow through. Hearing the word fun applied these days to nearly every activity minus any work, is growing old and tired with me. Jonas Salk may have had a passion for experimenting as a child, but he had to DO THE WORK, to make a contribution to the world down the line. Piano teachers are not asking their students to conquer competitions in international venues or make a resounding impact in a universe of musicians. We just want to give them the music education they deserve if they would meet us half way. So how did I finally deal with the student who plodded along without much if any practicing? Well, I invited mom in to observe one of her daughter’s lessons, since this parent had not been present from day one to see what was playing out at lessons. She was overloaded with full-time job obligations. And dad, a University educator had no way to check in, due to his involvement in Department matters. These parental absences in my opinion strongly factored into the student’s inertia. Dropped off by a baby-sitter, she felt like piano was the next care-taking station, but even worse there was another assignment lurking. So far, bringing the mother front and center into the lessons, has been an eye-opener for her. She began to see that her child could not sit back and expect the piece to be practiced all by itself. A commitment of time, energy, and mindful attention was needed to spur progress, interest, and attendant wells of joy and good feeling. I needed mom’s backing and involvement. And she needed to make sure her daughter set aside daily quality time to refine her pieces. I’m now carefully monitoring the situation, providing lots of positive strokes in response to the student’s conscientious work. As strange as it may sound, creating You Tube videos of playing that has improved through daunting applications of good practicing has been a motivator for this student and others. These children want their friends to see them shine on the big screen, and it has the secondary gain of pushing the peers along in the same direction. I now have three 9-year olds who are in healthy competition to master their pieces and display their accomplishment at any opportunity. This has been a turn-around that I hope has a lasting effect. We’ll see. In the meantime, I’ve learned how vital a parent’s presence is in the triad of support we need to make lessons a happy experience for all. Enrolled in a bi-lingual (Spanish/English) immersion program, she has enjoyed the romp with pieces in Latino style. The whole piece matured in baby steps. This approach turned her playing around, increasing her interest in practicing with an eye and ear to detail. 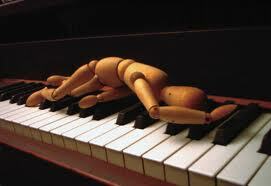 Piano Lessons: Skimming the Surface or Getting Deeply Involved?